In 2014, the U.S. Geological Survey reported 562 earthquakes of magnitude 3.0 or greater in Oklahoma and 180 in California. In addition to Oklahoma, states such as Kansas, Texas, Ohio and Colorado have seen increased seismic activity. California has long been considered the earthquake hub of the U.S. mainland, but Oklahoma began catching up in 2009. Through one month of 2015, Oklahoma has far surpassed California in seismic activity. The USGS recorded 76 earthquakes of magnitude 3.0 or greater in Oklahoma during January, compared to only 10 in California. Last year, Oklahoma also passed Alaska, the nation’s perennial leader in total earthquakes. Many small quakes in remote areas of Alaska go unreported, though. Numerous studies note an uptick in seismic activity in areas in which wastewater disposal from fracking, or hydraulic fracturing, is occurring and where faults already exist. North Dakota is a leader in fracking and has not had a sizable increase in earthquakes. But, the state’s major shale oil deposits are not located near faults. None of the recent Midwest quakes have resulted in deaths, though one in Oklahoma caused the roof of a house to collapse. A woman injured in the incident is suing two oil companies for allegedly triggering the earthquake, but the Oklahoma Geological Survey said in a 2013 statement that the 5.7 magnitude quake likely occurred due to a natural sequence. The USGS is currently trying to update its earthquake hazard map to address how human behavior is impacting seismic activity. When the faulty science behind the warming earth was debunked Global Warming was rebranded as “Climate Change”. Faultlines releasing pressure in the form of an earthquake is what they do. Whether it happens frequently, like with the San Andreas fault, or infrequently, like in Boston or Oklahoma, it happens when it happens. Climate change was only debunked on fox news. Some people will believe anything they are told, even if faced with facts that prove them wrong. It’s called cognitive dissonance. @Kettle Check your facts. Fox News debunked “Global Warming” and admitted to “Climate Changes” long before it was Politically Correct to do so. The three earth quacks (7.2 thru 8.2) that hit near the borders of Missouri, Arkansas, Tennessee and Kentucky between December 1811 and February 1812 (Now referred to as the New Madrid fault) were a direct result of Hydraulic Fracturing also! Or could it be it was a previously undiscovered fault that was due to move on its own? Gotta love auto correct! Quakes – Even though there are some quacks here too. Hopefully we won’t start getting Tornadoes. I can’t figure out why those states in question are making our Hebrew God so angry where He has to initiate earthquakes in their land. Maybe Pat Robertson, our great leader of Christianity, is right when he said that most earthquakes are caused by there being gays and lesbians which our Hebrew God despises! “Robertson also said the widespread practice of homosexuality “will bring about terrorist bombs, it’ll bring earthquakes, tornadoes and possibly a meteor.” (Norfolk Virginian-Pilot, June 10, 1998) A meteor too? There go the property values in San Luis Obispo County. Please do Not cut and paste content as comments that are from other site’s and spammed all over the web. Google has many many copy’s of “your” comment. but hasn’t Texas also been fracking since the 1960’s or so, any increase in earthquakes there? I think the change is due to global warming………..isn’t everything that changes global warming’s fault, oh yeah that or George Bush’s fault. That George Bush fault line is quite unstable, no? Oh yes! And, I just heard there is indisputable evidence the earth is actually flat! Truth! Bengazi! 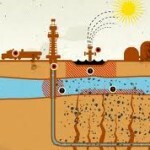 Hydraulic Fracturing (“Fracking”) has been around since the 1940’s. The only “new” thing that has occurred or changed in recent decades, basically, is the lateral drilling (going down one shaft, and spreading out under ground, thus limiting the number of above-ground penetrations). Whether it contributes to earthquakes, I do not know and I’m sure there will be folks on both sides who claim it does or does not.